HOTH is a Melodic Black Metal band from Seattle, that have made a name for themselves with the release of their second album “Oathbreaker”, a concept album based on the Star War universe. Four years later the band is putting out their third album “Astral Necromancy”, also a concept album, but this time with a more conventional motif of black magic. I feel that musically HOTH is most indebted to IMMORTAL. Melodic Death and Black Metal bands like DISSECTION or OLD MAN’ S CHILD also come to mind, but it is something about their riffs – some of the groovy BATHORY touches – and the croaky Abbath-esque vocals that remind me of IMMORTAL the most. Their music also has a geeky fantasy aspect which in the context of Black Metal was pioneered by IMMORTAL. Comparisons can only tell us so much. HOTH are doing their thing and they are getting better at it with every album. What makes their song really catchy – headbangable but at the same time atmospheric – is the shifting between groovy BATHORY inspired riffs and the typical evil Black Metal arpeggiations. And also that the riffs and vocal melodies are really memorable from song to song. I could pick songs that I like better then others, but overall there is always something that stands out and catches your attention. I really can’t emphasize enough how entertaining this record is, sometimes the melodies are so simple, catchy and upbeat that at times I was almost getting the feeling that I’m listening to Power Metal. Just check out the melody of the chorus of “Citadel of the Necromancer” – it sounds like some straight up corny Folk Metal. (I’m actually not even sure if I can call it a chorus, since there is no singing, but I imagine that with a vocal melody it would sound hilarious.) Some songs, on the other hand, can have a really majestic atmosphere and an ethereal quality that we find in the best of Atmospheric Black Metal releases. You can tell that a lot of work went into this album, every song is crafted to perfection, there is no excess fat on this 50 minute album. 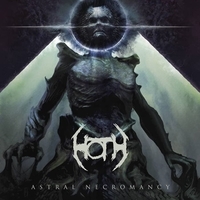 HOTH are the kind of band that are capable of creating their own musical universe and it’s a universe that I really enjoy visiting, although like in the case of similar bands like CRADLE OF FILTH or BAL-SAGOTH it is mainly for entertainment purposes. I feel like their songs are like very nicely cut gemstones, but they lack a bit in substance. That being said, I still really dig this album and I would recommend it to everyone who doesn’t mind a bit of melody in his extreme Metal.